Photo public domain image, via Wikimedia Commons. This week—on Monday, July 23—Sally Ride passed away after a battle with pancreatic cancer. She was 61. Dr. Ride was a physicist and passionate advocate for STEM education for girls, a position she bolstered through her fame as a former Space Shuttle astronaut. In fact, she was the first American woman in space, and only the third woman worldwide to travel into space. She flew twice aboard the Challenger, first in 1983 and then again in 1984, when she controlled the Shuttle's robotic arm to deploy a satellite. Later, she served in the investigations after both the Challenger and Columbia disasters, the only person to sit on both committees. 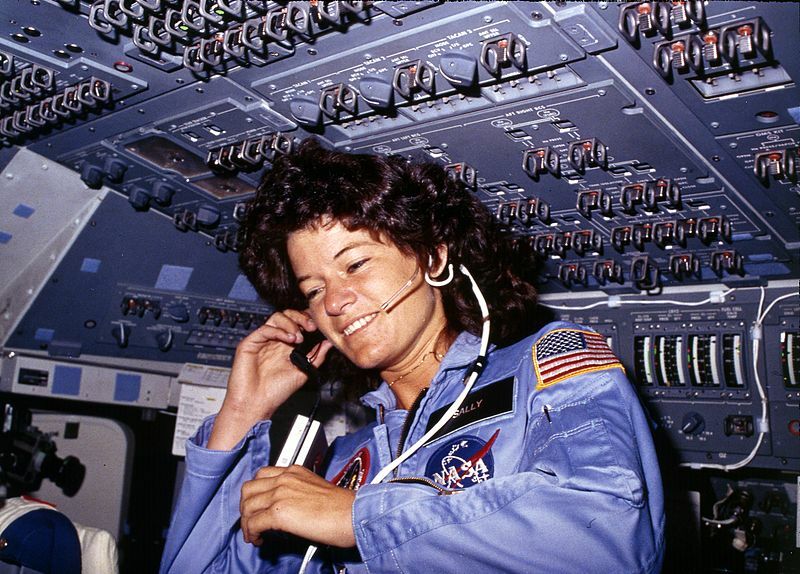 After retiring from NASA, she started Sally Ride Science, a company devoted to providing educational materials and classroom presentations to schools, specifically with an eye toward encouraging girls in the fields of science and engineering. I remember her flights well, as I paid a lot of attention to the space program when I was young. (I also loved the robotic arm on the Shuttle, and wanted a chance to play with it. Now I understand that, while it might resemble a video game, it's a video game with millions of dollars in equipment at stake. However, I still haven't gotten over wanting to play with robotic arms. I can admit that, right?) I was the kid who wrote letters to NASA, asking for photos and information about their spacecraft. I have the pictures they sent me in a stack on my desk right now, in fact, and I'm looking at them as I write this post. While the photos themselves predated Dr. Ride's trips into space (the last group photo in the batch comes from the third flight, STS-3, while she first flew on STS-7), my greatest interest in the Shuttle peaked during her time as as an astronaut. Nadia Drake's personal story from her childhood brought tears to my eyes. Similarly, I love astronomer Meg Urry's tribute. Here's the big New York Times official obituary, which (as you might expect) is quite good and thorough. While we rightfully celebrate Sally Ride's accomplishments, let's face it: the United States was really late in sending women into space. Institutional sexism delayed women astronauts far longer than should be acceptable in any civilized nation, and the locker-room culture at NASA during that era bears a lot of responsibility for the problem. Thirteen women trained to be part of the Mercury program, but were barred from ever flying. I lost a lot of respect for John Glenn when I found out he actively worked against allowing women to fly. Natalie Wolchover at Space.com examines why there aren't openly gay astronauts in much more detail; here's another post on a similar personal note, from a lesbian astronomer. Please leave your recollections of Sally Ride in the comments. When I was a wee sprog, we had a series of books about famous women: Marie Curie, Jackie Joyner-Kersee, Helen Keller... and Sally Ride. She was one of my heroes even before I knew why it was important that women should be astronauts if they wanted. Shmeat and Potatoes: The dinner of the future?